Easy to set up & use, this alarm offers motion detection & live monitoring through your smartphone. Power switch to remotely turn on and off household appliances. The Yale Smart Home Alarm, View & Control Kit SR-340 is the ultimate fully featured home automation wireless burglar alarm system designed for any size of home with a broadband internet connection*. The SR-340 View & Control Kit includes 9 components, but can be expanded to include up to 20 components allowing you to tailor the system to your home. Take a look at what's in the box and the wide range of accessories you can add here. Part of Yale's exciting Smart Living series of products, designed to make life easier and safer, the intuitive wireless Smart Home system allows you complete control of your alarm from your Smartphone. The PIR Image Camera will capture images of an intruder when the alarm is triggered for viewing on the app and the addition of the Yale Power Switch makes this a true home automation alarm allowing you to remotely turn on and off home appliances. 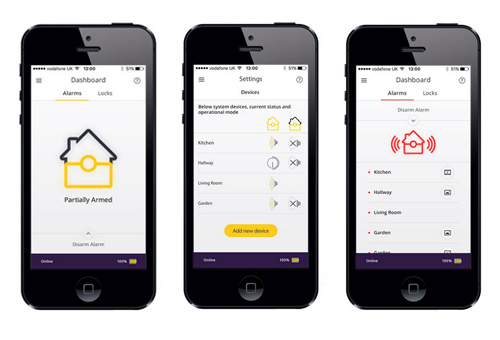 The system is armed or disarmed using the included Keypad or via the Yale Smart Home Alarm App (available for iOS and Android) and includes a pre-set 20 second entry/exit period. When the alarm is triggered a loud internal (94dB) and external (104dB) siren will sound to alert others of an intruder and the system will alert you via email and text message. The Yale Smart Home Alarm, View & Control Kit SR-340 is easy to fit - no wiring or running cables in walls or under the carpet and you won't need the services of a qualified electrician. The wireless alarm components are pre-linked and have a wide 30 metre wireless range using the highly reliable 868MHz frequency, ensuring you can place them practically anywhere. The home automation Power Switch allows you to remotely turn household appliances such as a lamp or radio on and off using your SmartPhone.